By all rights, Misrata, Libya’s third-largest city, ought to be in a mess. The late Colonel Muammar Gaddafi considered the place to be a hotbed of resistance during the 2011 revolution and his troops pounded it with everything they had (including Scud missiles). The resulting levels of destruction prompted some foreign reporters to evoke the battle of Stalingrad. Two years later, Libya as a whole is still trying to recover from the chaos of the civil war. A stuttering economy, fractious militias and a weak central government certainly are not helping. Yet, today’s Misrata offers a remarkable study in resilience. Much of the wartime devastation has already been cleaned up — and even where it has not, spiffy new shops thrive on the ground floors of buildings whose upper stories are still burnt-out facades. The downtown area is humming with commerce. Traffic jams are frequent. And the militias that earned the city so much fame during the war are nowhere to be seen. Checkpoints are nonexistent; the only armed men to be seen on the streets wear the uniforms of the Libyan police. Still, one can hardly accuse Misratans of waiting for a green light from Tripoli before pushing ahead with revitalising their city. 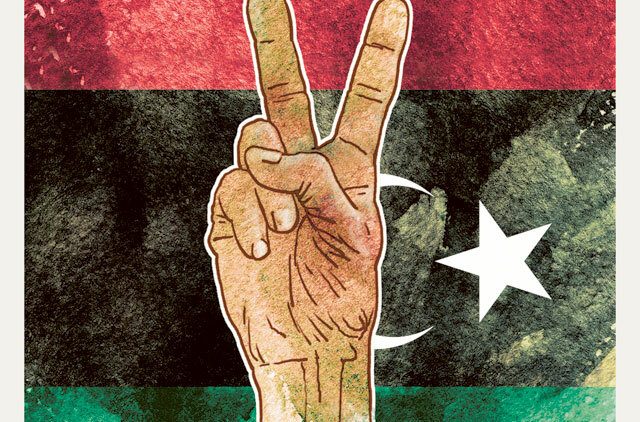 On many fronts, they are exploiting their newfound freedoms to the full — and the results offer a lesson in both the opportunities and the risks of the wide-ranging autonomy that Libya’s revolution has ended up bequeathing to many of its communities. In Misrata, a big part of the story turns on the city’s remarkable sense of self-reliance — fuelled, perhaps, by local pride in its status as Libya’s unofficial commercial capital. The revolution was still under way when a group of businesspeople got together to plan the refurbishment of Misrata Airport, which was heavily damaged during the war. Thanks to private funding, though, the airport re-opened for business in December 2011, just two months after Gaddafi’s death. Where only domestic airlines operated before, now there are regular flights by Tunisian, Turkish and Jordanian airlines. Local business assistance has also boosted Misrata’s port, which recently reached 90 per cent of its prewar capacity. When Misrata’s local TV station fell behind in payments to the satellite broadcasting company that carries its signal, Misrata tycoons stepped in and paid off the arrears. The Local Council has shown its share of initiative. One of its achievements is the establishment of a one-stop shop for Misratans wishing to start new businesses. In Gaddafi’s day, registering a new commercial enterprise required days of red tape (and attendant bribes). Now you can do it all in a morning (and local businessmen say that most of the graft has fallen away as a result). Despite its vows of compliance with national law, the local government has also dramatically simplified procedures for all goods passing through the port. Misrata even sends its own trade delegations on trips abroad — just the sort of thing that has other Libyans understandably wondering whether the city is contemplating breaking away from the rest of the country. The business environment also enjoys another advantage: Security in the city is comparatively good. The reason seems to be that the myriad of local militias spawned by the revolution have largely fused with the local administration. Shaklawon says that there are still some 250 qatiba (“brigades,” as they are euphemistically known) in Misrata, but he insists that they are all seamlessly integrated into the municipal security plan, which assigns them specific tasks under the auspices of Libya Shield, the central government’s initiative for re-integrating the revolutionary fighters into an internal security force. Shaklawon hastens to reassure the sceptical outsider that the brigades know their limits: “No qatiba in the city can move a tank from one base to another without the Local Council’s permission.”Getting the fighters to give up their tanks in the first place, though, seems to be out of the question. Yet, even Misratans are aware that keeping the militias around is not a viable long-term solution. “Security is starting to get bad,” says Abdul Gadar Fasuk, a local journalist. Many Misratans blame the troubles on sabotage by Gaddafi loyalists, but the real reason is simpler. People, he says, “don’t respect the laws. They’re using guns to solve their personal problems”. It is not much of a stretch to say that the same principle applies to some of Misrata’s dealings with the rest of Libya. If Misrata is starting to look something like a quasi-autonomous city-state, then it is the Misratan militias stationed in other parts of the country that are the primary tools of its foreign policy. Last year Misratan militias staged a punitive attack on the city of Bani Walid, which they regarded as a stronghold of unrepentant Gaddafi supporters. Misrata’s qatiba are also responsible for preventing the return of some 35,000 people from the city of Tawergha who were expelled from their homes for their presumed loyalty to the old regime back in 2011. There are still even some Misratan militia detachments in Tripoli — a holdover from revolutionary days that probably best exemplifies Libya’s continuing fragmentation. Many Libyans do not see the elected interim legislature, the General National Council (GNC), as truly representing their interests. For a city like Misrata, whose inhabitants view themselves as the victims of decades of neglect under Gaddafi’s rule, having their own armed contingents in the capital is a way of making sure that their demands get heard — a kind of political insurance policy. Other cities (like the desert stronghold of Zintan) keep their own armed contingents in the city out of similar motives. As the militias manoeuvre for advantage, the chance of devastating flare-ups always looms. Within just the past few days the government in Tripoli has seen fit to deploy Libya Shield forces loyal to it throughout the capital in order to prevent a possible “coup” against the GNC. (Some sources say it is the largest mobilisation since the end of the revolution.) Perhaps ironically, most of the Libya Shield forces involved are from Misrata — and so is their commander. Tripoli remains, to a certain degree, at the mercy of the outsiders, and there’s little reason to presume that this will change anytime soon. Amid the current turmoil, some Libyan cities are definitely more equal than others. Christian Caryl, the editor of Democracy Lab, is a senior fellow at the Legatum Institute and a contributing editor at Foreign Policy. He is also the author of a new book, Strange Rebels: 1979 and the Birth of the 21st Century.